Green Man Gaming Hosts Enticing "666 Sale"
Despite its sacrilegious name, Green Man Gaming's 666 Sale has almost nothing to do with Beelzebub and everything to do with huge gaming discounts. Every six hours for the next six days Green Man Gaming will debut six new videogame deals on its retail website. Now you understand the reason for the ominous "666 Sale" bit, but who is Green Man Gaming? While the company is far less popular than Amazon or Steam for those who purchase games online, it's slowly gained a large, devoted following. I've ordered from them, and not only is Green Man Gaming very prompt with its shipments, but the firm also offers really insane discounts nearly as often as its much larger competitors. To wit: If you were to visit the Green Man Gaming website this very minute, you'd find the current selection of six big discounts the company has on offer. 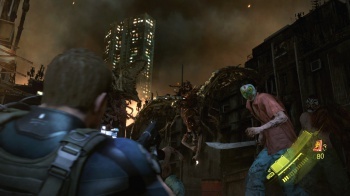 Resident Evil 6 has had its price tag cut in half. Borderlands 2 and its Season Pass can be had at a massive 75-percent discount. Even smaller titles like the co-op hit Killing Floor have seen big price drops - that game can be yours for only $5, one-quarter of its usual price. Of course there are always caveats with any promotional offer, but the ones in place here seem pretty minor. Obviously the 666 Sale ends after six days, so if you want to get in on these savings you should probably act fast. Further, the games change every six hours, so if you see something you like you don't have much time to throw down your cash. However, to counteract these caveats (and because Green Man Gaming is overwhelmingly generous), the company has also attached "Devilish Bonus Offers" to the sale. We expect them to change periodically, but at the moment you can find a coupon for an additional 10-percent off your purchase on that very same page where you can browse the 666 Sale's current offerings. Bottom line: There's some great purchasing opportunities here for anyone not too offended by the site's use of the Sign of the Beast to sell PC games.